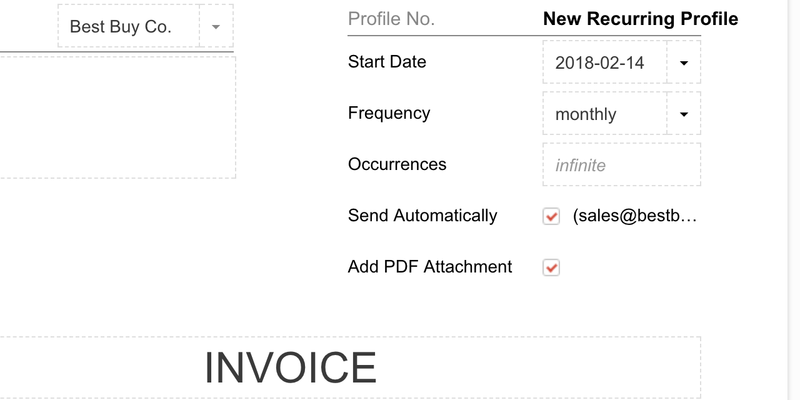 How do I create recurring invoices? Recurring invoices are useful when you have recurring type of work for which you charge your client on a weekly, monthly, yearly etc basis. It works great for retainer type of work where the amount is the same each time. In order to create it you need to go to Accounting -> Recurring and create a recurring profile by selecting the start date, frequency, occurrences, if you wish them to be sent automatically or not and to attach a PDF to the email. When the start date comes they will be created and appear in the Invoices area. If you don't select to send them automatically you will need to go to the desired invoice and send it manually by clicking on the Send button.